Small downy woodpeckers are common in Westborough's woods and at birdfeeders. The red patch at the back of the head identifies this one as a male. Winter finally arrived in mid-January, but warm or cold, winter is a good time to spot woodpeckers in the leafless woods or at a birdfeeder. Downy woodpeckers (Picoides pubescens) live in Westborough's woods year-round and often show up at feeders, especially when insects are scarce in the winter. They're our smallest woodpeckers, about the size of a sparrow or chickadee. Their black and white markings camouflage them well against tree trunks. Male downy woodpeckers sport a bright red patch of feathers at the back of the head. Downy woodpeckers look very similar to hairy woodpeckers (Picoides villosus), which are larger – about the size of a robin – and have longer beaks. Hairy woodpeckers are less common in our area. 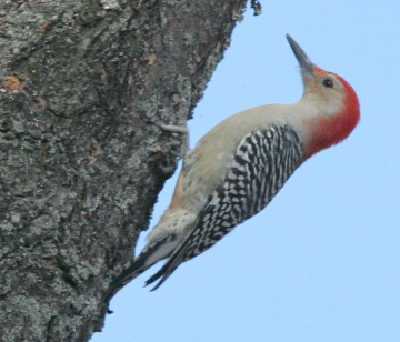 Another woodpecker, the red-bellied woodpecker (Melanerpes carolinus), is becoming more common in our area. Its range has been extending northward into Massachusetts since at least the 1970s. The red-bellied woodpecker is larger than the downy woodpecker. Like the hairy woodpecker, it's about the size of a robin. It has black and white zebra stripes on its back. Males have red on the top of the head and back of the neck. Females have a smaller red patch, only on the back of the neck. What about the red belly on red-bellied woodpeckers? It's very faint. You're unlikely to see it unless you get a very close view of ruffled belly feathers. Many of the characteristics in these woodpeckers' names – downy, hairy, and red-bellied – were noted in the past by people who examined dead birds. Needless to say, these folks got a much closer look than most of us get today, even with good binoculars. Woodpeckers have benefited from the changes in land use in New England over the past hundred years, namely the disappearance of farmland. As trees have reclaimed abandoned fields and pastures, woodpecker habitat has increased. Woodpeckers live, feed, rest, and nest in trees. Westborough has been very much part of this trend. If you've walked in the woods and noticed old stone walls there, you've seen evidence of past farming. Bowman Conservation Area, Headwaters Conservation Area, the Libbey-Wile Forest land, and Sudbury Valley Trustees' Walkup and Robinson Reservation are some of the many places in town with stone walls from the past. A red-bellied woodpecker forages for insects in big, old trees near the Charm Bracelet trail along Hoccomocco Pond. When they peck, woodpeckers brace themselves with their stiff tail feathers. Their strong, chisel-like bills are good for digging out insects, excavating nest holes, and drumming to communicate with potential mates or rivals. Farming has declined markedly in Westborough in the last 25 years, but much of this recently lost farmland has gone into development instead returning to forest. Both the downy woodpecker and the red-bellied woodpecker tolerate fragmented habitats relatively well, and these woodpeckers may be continuing to increase in our area. Hairy woodpeckers, in contrast, are less tolerant of fragmented woodlands and also need mature forests. We have woodpeckers to thank for creating a supply of housing for other birds and wildlife. Many birds – including tree swallows, bluebirds, titmice, nuthatches, owls, and ducks such as wood ducks and hooded mergansers – nest in tree holes but aren't equipped to dig their own holes. Woodpeckers actually excavate holes. Some woodpeckers make three different holes each year for different purposes: nesting, roosting at night, and winter protection. Their abandoned holes become available to others birds. Animals such as red squirrels, flying squirrels, and mice also use woodpecker holes. What are these sought-after holes like? The entrance hole is only big enough for an adult. That's about 1-1/4 inch wide in the case of a downy woodpecker's hole. Inside, this hole goes straight down for 8 to 10 inches. For a wooded area to attract woodpeckers, it needs standing dead trees and live trees with rot. Dead or rotting wood supports insects that woodpeckers and other birds eat, and it's suitable for excavation. People are often tempted to clear deadwood from their own property and from conservation land, but this practice makes the area less suitable for woodpeckers and the other birds and wildlife that rely on woodpecker holes. When you're walking and watching for woodpeckers, look for big, dead trees. If you're on the lookout for woodpeckers, you may notice that downy woodpeckers live relatively solitary lives at this time of year. You may see one at a feeder or in the woods, but even the male and female of a pair go their own ways within a 5 to 35 acre range. If they both show up at a feeder at the same time, the male may chase off the female. 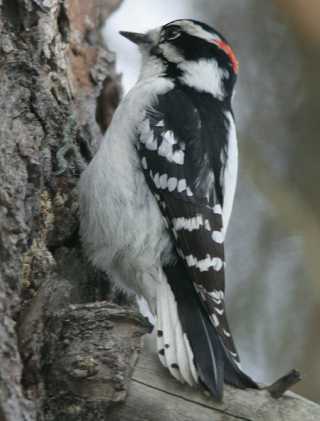 Sometimes you'll notice a downy woodpecker in a mixed flock of chickadees and other birds. Because there's safety in numbers, this arrangement allows a downy woodpecker to spend more time actually feeding and less time watching for danger. In another month or so, you'll probably hear woodpeckers. They don't sing during courtship like so many other birds, but they drum instead. Starting in February or March, for instance, the male and female of a downy woodpecker pair become more interested in one another. They start drumming to communicate, each at their own drumming posts – favorite dead trees or limbs, or sometimes even a drainpipe on a house. Over time, the male and female spend more time together and explore different trees as possible nest sites. They establish and defend a small nesting territory of about a quarter of an acre. Eventually, they find a suitable tree and both start excavating the same spot, typically sometime in April or May. Aspens are often favorites. The male does most of the excavating. They line the nest area with sawdust and wood chips. Once the female lays 4 or 5 eggs, in late May or early June, both parents take turns on the eggs, switching every hour or so. The male spends the night on the eggs, while the female sleeps in another hole. The eggs hatch after 12 days. The parents feed and care for the young in the nest for about three weeks, and then may feed and look after them for up to three weeks after they leave the nest. You may see another woodpecker, the northern flicker (Colaptes auratus), when it returns to our area in late March or April. Flickers eat ants on the ground but still excavate nest holes in trees.